What is the Terror Barrier and how do you get past or through it in one piece instead of feeling like you have been beat up and spit out in a million tiny little pieces? Sometimes it’s not possible to not feel like someone or something has ripped you to shreds and left you in a pile of tatters wondering if you will ever be able to put the pieces back together. It can, at times feel like it’s just easier to stay where you are because the risk of not knowing what’s on the other side is just too frightening, scary or terrifying. Making a decision to go beyond your comfort zone can be very intimidating and make you feel like you don’t have what it takes, the knowledge or the skills to do what you want. Ego-chitter chatter can cause a wide range of anxiety, feelings of being nauseous and make you procrastinate till you are so frustrated that you simply do nothing, nothing at all. When you do nothing at all because you feel paralyzed by fear, the Ego-chitter chatter wins by keeping you in your place, in a place of doubt and fear, chaos and confusion. Allowing outdated mind-sets and beliefs to keep or hold you prisoner within a small confined space mentally and emotionally is a prison that leaves you without any options. Have you heard the phrase — face the fear and do it anyway? — There is so much truth in those seven words. Face the fear and do it anyway. Facing the terror barrier with courage and determination is the key to having, doing and being where you want to be. It is the key to transforming your dreams into reality. It is the key to accessing your Higher-Self and your Angels, having more harmony in your life and work. Each time you face your fears, the terror barrier that attempts to keep you prisoner emotionally and mentally, you become stronger, more confident and empowered beyond your current sense of knowing. Face the fear and do it anyway. Face your internal terror barrier and breakthrough the constant Ego-chitter chatter with courage and determination. If you need help facing the terror barrier and are determined to have a better life with more confidence, raising your inner vibration to the next level and beyond, I’d love to help you create a breakthrough by applying for a private, Breakthrough Strategy Session with me. Stop right now, click on this link and send me your application right now! Terrie Marie, D.Ms, the Angel Mentor, helps Executives, Authors, Healers, Consultants, Business Owners, Coaches, Entrepreneurs and Visionary Leaders raise their wealth frequency with their Angel Dream Team Executive Board of Directors, raising their inner vibration, generate more income with every venture they start, enhance the Law of Attraction, attract more clients who are ready and willing to pay their fees, and improve relationships, transforming Dreams and goals into reality! 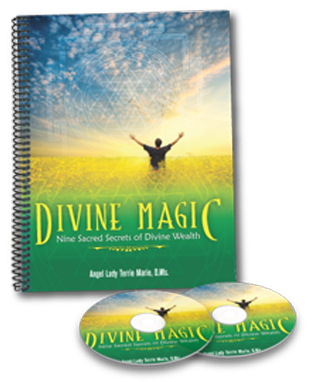 Visit the Angel Lady’s website for practical, useable tips and strategies, how-to-articles and 3 Free Videos on Angel Archetypes and Your Inner Wealth Frequency! Did you know that the word Chakra is Sanskrit, originating from an ancient language, meaning wheel or vortex? The word Chakra refers to all energy centers or energy vortexes throughout your Aura, emotional energy body and your physical body. Energy centers regulate the flow of energy through your entire being. Each Chakra flows one into the other blending with the energies of Chakras both above and below. The Heart Chakra, for example, flows upward to your Throat Chakra allowing you to speak with emotion. Energy from the Heart Chakra also flows downward, blending with your Solar Plexus Chakra, allowing you to manifest with emotion, compassion, and focused intention. Chakras can become under or over stimulated, displaying a variety of physical, mental, or emotional manifestations. Cleansing and balancing your energy centers promotes better physical, emotional, and mental health. It also helps you raise your inner wealth frequency too! There are several ways to cleanse and balance each energy center. One such way is to visualize each Chakra or energy center as a wheel or fan, spinning clockwise. Chakra Angels help you maintain balance in each of your Chakra Energy Centers. Did I mention that there are only a few hours left to save 30% on all Angel Paintings and Angel Card Sets? Time is slipping away and I really don’t want you to miss out on the savings! PS … Time is slipping away on the Gallery of Angels Grand Opening AND the 30% savings on all Angel paintings and Angel Card Sets! Click here so you can get in on the savings!!! Transition can be messy energetically, mentally, emotionally and Spiritually. It’s all about being consciously aware of all the signs, messages and guidance you are receiving to make changes in your life. Changes include but are not limited to the kinds of food you eat, what you drink and the people with whom you surround yourself. Perhaps the biggest or most profound change occurs within, affecting your energy vibration, your inner frequency on multiple levels. Today, I want to share with you part of my own journey during what is for me a time of great transition and ultimate transformation. During the past several weeks, I have been experiencing a profound transformation raising my energy vibration to higher and higher levels of frequency. There have been moments of doubt as to the next step or set of steps that I needed to take forward along my own journey of continued self-discovery. One morning last week, I woke feeling quite dizzy which is a typical reaction for me when I have eaten something that my physical body is no longer able to process because it’s out of alignment with my new higher vibration. Very quickly, I mentally assessed all that I had eaten the previous day. After identifying what caused the physical reaction of dizziness, I rested for the next 3 days as my physical, mental and emotional energy were once again in alignment with my new higher energy frequency. Raising your vibration is a continual process; at least it is for me. The higher my vibration, the more connected I am with Source more often, which in turn enables me to be of better service to you and our Global Community. As you walk your path, which is as unique as you are, you will from time-to-time need to have all your energy bodies and your physical body re-aligned with your current vibration enabling you to flow with the transition process. Transition is one of the magic words that tends to conjure all sorts of doubt, fear and possibly confusion especially when “ego-chatter” attempts to keep you where you are, or keep you stuck in an energy vibration that no longer “fits” you or the vision for your life. This is the perfect time for an Angel Makeover Ritual which detoxes all your energy bodies, aligning your Chakra Energy Centers and connects you with Angel Energy at the highest possible vibration easing your transition, creating a catalyst for your personal breakthrough. I want to help you raise your inner vibration, your inner wealth frequency, detox your energy bodies so that your transition flows easily, with as much harmony and balance as possible. Remember to nurture and indulge yourself during times of transition. Be open to receiving all that your Angels want for you. Experience your before-and-after with a Private Virtual Angel Makeover Ritual (click here) raising your energy frequency so that you manifest more of what you want and so much less of what you don’t. PS: Hello and Welcome to YOU, especially if you have recently joined our Angels and Your Inner-Wealth Frequency Community! Please forward this Ezine with your friends and colleagues! Angel Lady Terrie Marie, D.Ms., an Internationally Acclaimed Angel Coach and Mentor who helps Executives and entrepreneurs connect with their Angels to raise their inner wealth frequency accelerating their 6-figure income. This year, 2013, seems to be an incredible “time” of change and transformation! So here’s what’s happening, and it directly affects you! Single session Angel Readings, Energy Healings and Angel Attunement’s are going away February 28th! That means, beginning March 1st these services will only be available as part of a package but I’ll share more about that with you later. Just like anything that is truly of value, it takes more than one single session to clear away the mental and emotional clutter, connect with your Angels, breaking free of past conditioning. Now’s the time to get that Reading, Healing or Angel Attunement. I will honor all requests that are received (and paid for) by February 28th. Short, sweet and to the point … now’s the time to get your …. *Angel Attunement: Angels offer you a very powerful gift with the purpose and intention of clearing blocked energy, releasing self-limiting beliefs, healing past pain and sorrow, increasing prosperity and abundance, healing relationships past and present in accordance with the Law of Increase. Yes, I’m still offering both 30-minute and 60-minute sessions but they are ending February 28th! PS … Single session Angel Readings, Energy Healings and Angel Attunement’s are going away February 28th! Did you know these are going away very soon …..
It’s Angel Lady Terrie Marie and I want to share something new with you! Because so many men and women just like you have questions they really want and need answers to, I am introducing 30-minute Angel Readings and Angel Energy Healing Sessions! Angels are here to help AND so am I! I would love to help you receive answers from your Angels and help you detox your energy, releasing and healing all that truly no longer serves you, your purpose or your path. PS … Introducing 30-minute Angel Consultations and Angel Energy Healing Sessions! There has been so much “chitter-chatter” about what is or isn’t going to happen on 12-12-12 and what’s happening after 21-2012 AND then there’s even more speculation about the energies of 2013!!! I have it on “good authority” that we will all still be here!!! Are there going to be changes? Yes, of course. Things as we have come to know them have been changing and shifting for quite some time. The rate at which “time” moves has increased over the past several years AND it has been steadily increasing at an even faster pace since 2009. What do you need to do to prepare for these major shifts in energy both internally, Spiritually, mentally and emotionally? AND what can you do to maintain a sense of balance energetically during this incredible transition here on Earth? You’ve heard me or read what I’ve been sharing with you about Age of Angels and what it means for you and your path, your Life and Soul Purpose. Age of Angels is here to help you prepare for the greatest transition HumanKind has ever experienced in recorded history. Angels have been assisting, guiding, protecting, comforting and healing HumanKind throughout the ages. Angels offer you a very powerful gift intended to ease your ascension, raise your vibration and your conscious awareness during a time of great Spiritual Awakening for Earth and all who call it home. There is no doubt that there are very distinct shifts and changes occurring within you, around you and all over this planet. Each time you come to another point of mental and emotional breakthrough, you are confronted with increased levels of resistance requiring you to become vigilant and more conscious of protecting yourself with Mantras, White and Rose Light and even Electric-Violet Light. It is out of great compassion, concern and unconditional love that Angels are gifting you with the Angel Attunement. So let’s get right to it …..
As you work with your Angels, you will begin to witness and receive validation and confirmation of all that you seek to have, be, do and to manifest into your life. All life creates more life. More life creates abundance and prosperity, harmony, joy, peacefulness and a sense of deep contentment. This in turn creates a shield, a vortex of positive, loving healing energy all around your physical body repelling negative energy. It also helps you to minimize the inner-negative ego-chatter that attempts to distract you from your path. OH almost forgot!!! Because this is so important I am offering an introductory fee of only $77! BUT this will only last until Midnight December 12th and then it will go up to $97! You can create your own reality regardless of what is or is not happening in the outside world around you. PPS….as a special gift for you from me, I’m including as a bonus a Digital Print and Angel Message from Angel Samandiriel! This Angel’s name means He Who Sees Beyond and among his amazing Angelic Gifts are: Imagination, Creativity and Visualization! Angel Lady Terrie Marie, D.Ms., author of Inner-Balance and Harmony: Angel Messages for Healing and Inspiration, is an Internationally Acclaimed Master Angel Messenger who speaks and leads workshops that guide men and women who want Angels in their lives to hear, connect and communicate with their Angels. Terrie Marie has worked with thousands of men and women helping them connect with their Angels, many times in a matter of minutes! Visit http://angelladyinnerspirit.com/angels-believe-in-you/ to receive your free Angel gifts. 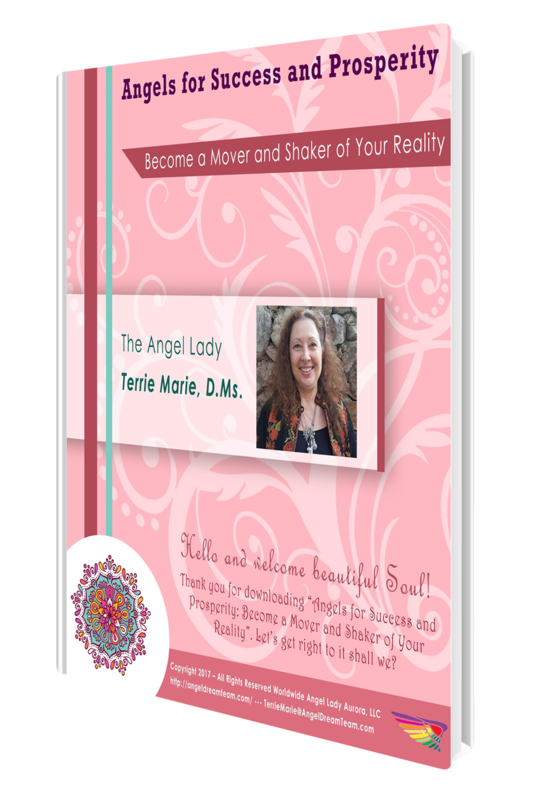 Get in touch with Terrie Marie by email at TerrieMarie@AngelLadyInnerSpirit.com . The Law of Polarity states that everything in the Universe has an opposite and it is equal and opposite. For every problem there is already in existence a solution. For every action there is any equal and opposite reaction. For lack to exist, abundance must also exist. There are two sides or aspects of all things, people, situations, circumstances and experiences. The Angel of Duality, Polarity and Balance provides insight into all the aspects of the whole. Insight allows you to see, feel, hear and experience differently. All that your conscious or thinking mind thinks and perceives is a sense of reality simply because you have experience the same “physical evidence” over and over and over and over again. Your sense of reality is reflected in the circumstances, people and situations in your life right now. Your feeling mind, the sub-conscious mind, feels and expresses through emotion which is then expressed and manifested within and through your physical body into physical form around you. Examples of Duality: night and day, light and dark, up and down, above and below, inner and outer, right and left. The Duality aspect reveals the potential in all things to see both light and dark, presenting an opportunity for integration and balance. Examples of Polarity: positive and negative, yes and no, chaos and harmony, life and death, stagnation and transformation, hate and love, sorrow and healing, lack and abundance. The Polarity aspect creates an automatic solution to any problem or issue. If you are experiencing lack in any area of your life, the solution or abundance of what appears to be lacking also exists. If it didn’t, the lack wouldn’t exist to begin with. The Angel of Duality, Polarity and Balance assists you in bringing together both aspects of what’s in front of you right now. The truth of being whole, complete and perfect appears to be flawed because this isn’t what’s being reflected to you. It’s not what you feel in your heart center. If you weren’t whole, complete and perfect you wouldn’t exist. It is that simple and that complex. How do you begin to balance duality and polarity? The 1st step is to acknowledge where you are and that there is within you the opposite of what has manifested around you emotionally and in physical form. The 3rd step is to open your heart and love that part of you, integrating it into your life. It’s about creating a new tapestry with the various parts or threads of your life in this moment. Integration creates balance. Balance clears the pathway to allowing all that appears to be lacking in your life to manifest into physical form. There’s nothing wrong with you. You are note broken beyond being loved, and loving. There is no real lack in your life except that which you have accepted as truths from others in your life. You are whole, complete and perfect. You are loved beyond measure. Angel Lady Terrie Marie, D.Ms., author of Inner-Balance and Harmony: Angel Messages for Healing and Inspiration, is a Master Angel Messenger who speaks and leads workshops that guide men and women who want Angels in their lives to hear, connect and communicate with their Angels. 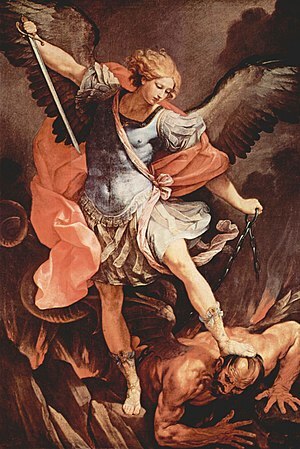 Visit http://angelladyinnerspirit.com/angels-believe-in-you/ to access information about Angels. Get in touch with Terrie Marie by email at TerrieMarie@AngelLadyInnerSpirit.com . 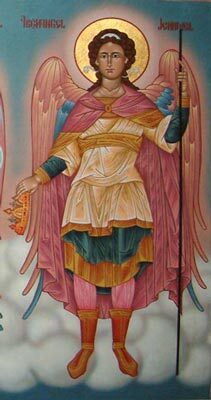 Archangel Michael is the protector of all who ask for his help from unwanted, lower negative energy. You will learn how to cut negative etheric energy cords from your physical and emotional energy bodies so that you are able to maintain a higher vibration of energy. When your energy is positive, you attract to you more positive energy and more opportunities to you. It is normal to collect attachments, Etheric energy cord attachments, in your daily life. Etheric energy cords are both positive and negative. You’re going to discover how negative Etheric energy cords are unconsciously draining your positive Life-Force Energy which causes you to feel and experience energy blockages. Once you have registered, you will receive your call-In and WebCast information so mark your calendar for April 17th at 7:00pm New York Time. Ps….the call will be recorded so even if you can’t make the live call, you won’t miss anything! Click on the link below to register today!